Another goal for your virtual assistant business this coming year is to add five new connections to each of your social media networks each week. You want to expand the exposure for your business by adding new connections on a regular basis on Facebook, Twitter, LinkedIn, Pinterest, and Google+. Choose one each weekday to add five new connections and watch your social media interactions grow. Look for people in your industry you might want to collaborate with. Connect with local small business owners who you may do business with. You’ll find me on each of the networks below. I invite you to connect with me! Where are you on Facebook, Twitter, LinkedIn, Pinterest, and Google+? I want to connect with you! Tonight I will be the guest on the Virtual Assistants Networking Group call. 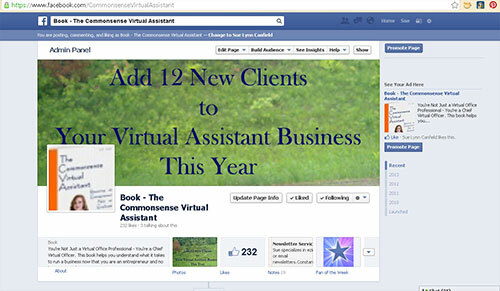 Many business owners don’t understand what a virtual assistant can do for them. Often prospects contact virtual assistants knowing they need help but unsure of specifically how a virtual assistant can help them. On the other hand, virtual assistants find it difficult to clearly define what they can do for their prospects. Join me for a lively conversation on this topic. Business owners are looking for some help but aren’t always sure exactly what they need. They contact virtual assistants but aren’t sure how a virtual assistant can help them. And many times virtual assistants find it challenging to educate business owners with information about how they can benefit the business owner. However, there are business owners who have been able to define what they need from a virtual assistant. They may have had an unpleasant experience in the past and now have finally found the virtual assistant for them. So instead of trying to explain to you, the business owner, how we virtual assistants can help you, I thought you might like to hear from these business owners who have used a virtual assistant. If you are a business owner, I hope the comments from these business owners will help you more clearly understand how a virtual assistant can help you with your business needs. And if you are a virtual assistant, perhaps these comments can help you define to your prospects just how you can help them. “For business owners with limited resources they are a great option as you can delegate a task to them with a deadline…no on-the-job training, no payroll taxes, no sick leave or unplanned absence – they take care of all this themselves. You get to define your problem, compare the solution you see with them, and let them take care of the rest. I’d love to hear your comments, both from business owners and virtual assistants.